RoboCrypt is an encrypted data backup application for Windows, combining the functionality of freely available utilities to backup data. 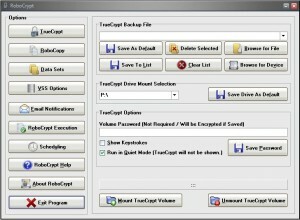 The application uses TrueCrypt, freely available at www.truecrypt.org to create and utilize encrypted backup files and/or volumes. The application also uses the available utilities from Microsoft (Robocopy, VShadow, and PowerShell) to allow you to backup data and optionally use Microsoft Volume Shadow Services for snapshot backups and PowerShell to send notification emails upon backup completion. This program has been designed to work with Windows XP/Server 2003/Vista/7/8.x/Server 2008. A help file in PDF format is included to give more details on how the program works. See a summary feature list below the screenshot. You can download version 2.0 here. It is recommended that you update the PRUpdate.exe online update component manually by downloading it from here and copying it to your RoboCrypt application folder (replacing the older copy). The updated file is included in the 1.2/1.5/2.0 installation as well. You should have PRUpdate version 2.5 to properly update the RoboCrypt installation. ALSO please note that v1.5/2.0 adds enhanced encryption of saved usernames and passwords. When you upgrade to v1.5/2.0 your saved passwords and usernames for TrueCrypt and email notifications will be removed and will need to be added again. PLEASE make sure that you know this information before upgrading. 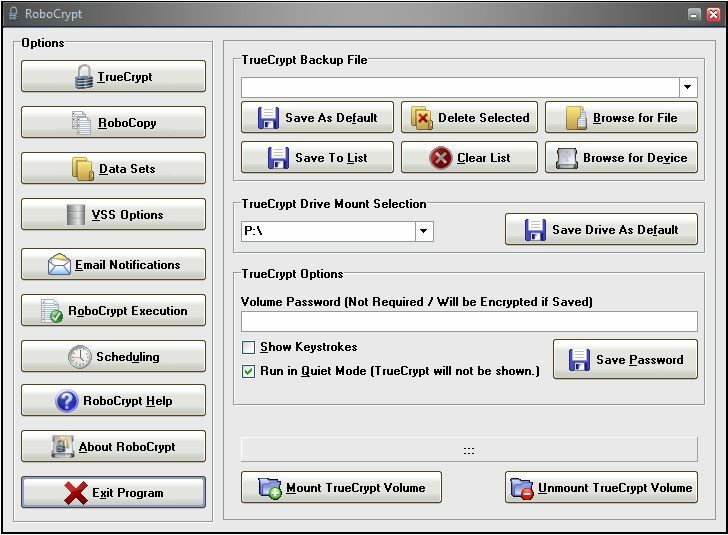 Changes/Fixes in version 2.0 : If TrueCrypt files that have been previously saved in RoboCrypt are re-saved, the file’s GUID will now be saved which can help with backups when a backup destination device changes assigned drive letters. Data verification is now possible using CRC32, MD5, and SHA-1 methods. A new utility called the RC Hash Tool has been added so that source and backup files can be verified manually if needed. The overall RoboCrypt application can now be password protected so that someone cannot open the program and view other saved usernames and passwords. Other bug fixes as well. Please see the Changelog and Help file for a complete list of new features and fixes. Changes/Fixes in version 1.5 : Many bug fixes, some of them critical dealing with VSS backups, data set file/folder exclusions, etc. Windows 8.1 support, pre and post-process execution functionality, manual file/date modification, forced TrueCrypt volume dismounting before backups, email summary attachment size limit and server timeout values, better encryption for saved usernames and passwords, and multiple recipients for backup summary emails added. Please see the Changelog.pdf file for further information. Windows Task Scheduler can be used to schedule an automated backup of a system daily, weekly, etc. Command-line options allow custom icons to be created for automated backups with RoboCrypt. Command-line options are explained in the included help file.